Black, liquid eyeliner, equipped with unique applicator for precise application. Liquid eyeliner is the most suitable product for outlining and underlining eyes. Use it to underline discreetly the shape of the eye or to draw thick, bold lines. The shape of the applicator and its pointed tip, allow maximum control and give the opportunity for quick and exact drawing of the desired outlines. 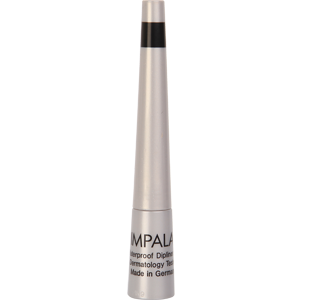 IMPALA Eyeliner 501 is long lasting, waterproof and can be removed easily with products, suitable for waterproof make-up.